SCAA debuts new quarterly publication which celebrates the arts in Cobb County and chronicles the expansion of their nonprofit's presence in the community. 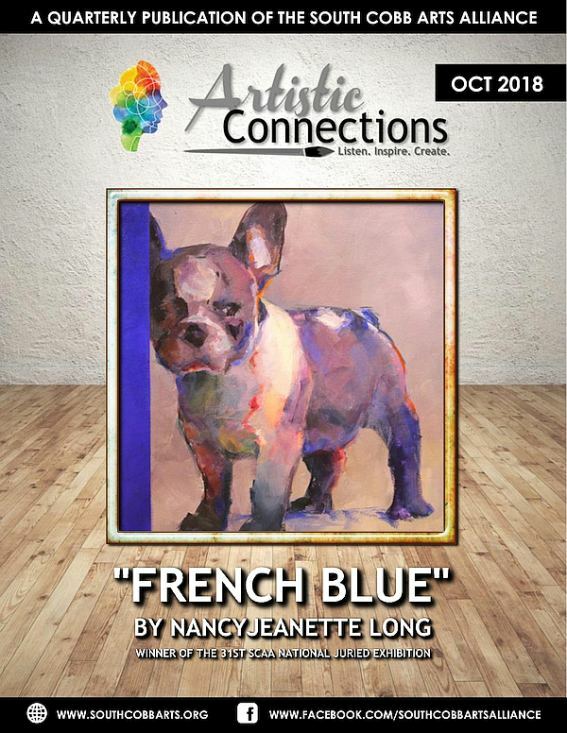 POWDER SPRINGS, Ga. - Oct. 4, 2018 - PRLog -- It was announced today that the award-winning nonprofit arts organization, South Cobb Arts Alliance, has debuted their new publication "Artistic Connections." The quarterly magazine will serve as a vehicle to spotlight and report on the organization's activities around the Cobb County communities. It will feature the SCAA's many events and contributions to Cobb County and celebrate the arts in all mediums, along with dynamic photography and compelling spotlight pieces on people and places who support the arts and work in tandem with the organization and its programs. SCAA President San Miller stated regarding the launch of the new publication, "We hope you will visit the online flip publication on the SCAA website or link to PDF version to read about the SCAA and how the organization works toward the enrichment of our neighborhoods. This new innovative publication both supports our initiative and reminds all of us how art can build and strengthen the community. The SCAA's vision is to empower and showcase the arts by reconnecting, enhancing, and growing engagement, while not forgetting to go back to the basics that are reflected in our mantra to 'listen, create, and inspire.' This is achieved by engaging one person, one event at a time." Authored by the SCAA's new Director of Marketing and Public Relations, Kiki Plesha, "Artistic Connections" was one of the projects that she spearheaded to support the nonprofit's new initiatives to raise awareness for the SCAA. Plesha, a long-time publicist in the entertainment industry, brings with her vast experience in marketing and public relations. A newcomer to Cobb County, the South Cobb Arts Alliance caught Plesha's eye when she sought out volunteer opportunities where she could combine her business skills with her passion for the arts and experience in the facilitation of quality entertainment and cultural events. "My job has had me moving around the country a good bit, and in each community where I've resided, I've always donated time to the arts. I did my research on my new neighborhood and quickly realized that, far and above, the South Cobb Arts Alliance would be my new 'home' for my volunteer efforts," states Plesha. "The enrichment the SCAA has brought to Cobb County over its almost 50-year span is impressive, to say the least. I am thrilled to be a cog in the wheel that positions this nonprofit for success and am honored to be working with such an accomplished Board of Directors." Part of the SCAA's plans include expounding on the group's programming to include more music, theatrical, and dance events, while continuing the quality art exhibits and workshops the SCAA already produces -- including the highly successful National Juried Exhibition – which just completed its 31st show at the Mable House Arts Center. The exhibit was recently featured in the Marietta Daily Journal in the number one slot of the list of "Top 5 Things to Do in Cobb County." The Mable House has long been the beneficiary for decades of the SCAA's programs and various donations by the organization to support the complex. The SCAA will be presenting their final event of 2018 at the Mable House Arts Center, Christmas House, which has been a popular and well-attended community holiday event that features handmade items by area artisans. The SCAA also just wrapped its final Candlelite Concert of the summer series at the Mable House Barnes Amphitheatre. The SCAA will be looking to new communities to present future concerts and other arts-related events for the enjoyment of Cobb County Citizens. With the election of the new Board of Directors for the 2018-20 term, which is comprised of business professionals with a wide variety of backgrounds in the arts and the corporate sectors, the focus is on acquiring sponsorships, identifying grant opportunities, increasing the SCAA membership, expanding the SCAA's programming, and growing the group's presence in more Cobb County neighborhoods. Since 1972, South Cobb Arts Alliance has presented the South Cobb neighborhoods with hallmark events celebrating the arts and opening doors to those in our community who might otherwise not partake in the arts. The South Cobb Arts Alliance invites the community to join their membership and become a part of their energetic and diverse group of volunteers and supporters. The mission of the South Cobb Arts Alliance, a 501(c)(3) nonprofit organization, is to build the community by encouraging appreciation and active participation in the visual arts, performing arts, and local heritage. The SCAA strives to advance to high levels the artistic standards of their members, their community, and the general public, by offering opportunities to extend experiences, to increase skills, and to share understanding, philosophy, techniques, and knowledge. For more information on South Cobb Arts Alliance, becoming a member or a valued volunteer, visit the website at www.southcobbarts.org. For media inquiries, interviews, etc., contact scaaorg@gmail.com or phone 864-571-0597.